You have important things to do in your Yahoo account, so let's get you back in! After you regain access to your account, consider switching to Yahoo Account Key to avoid sign-in issues entirely. It's free, more secure, and you'll never have to remember a password again. 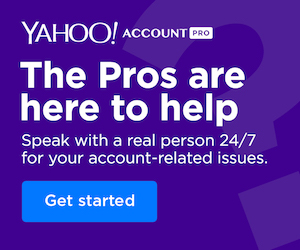 Use the Sign-in Helper to locate your Yahoo ID and regain access to your account by entering in your recovery mobile number or alternate email address. If you know your Yahoo ID but need to reset your password, make sure to create a strong password after you're back in to your account. If your browser remembers passwords, you can also check your autofill settings to find your password. Turn off "caps lock" or "num lock" - These keys change the value of what you're actually typing. Update your browser autofill settings - If your browser remembers passwords, you may need to update your autofill settings after changing your password. Try another web browser - If you can access your account in another browser, the problem isn't with your account; you'll need to fix the issue in your preferred browser. Someone changed your password - A hacker could have broken in and changed your password. Use the Sign-in Helper to get back into your account and change your password. Then, review your account settings to undo changes you didn't make and secure your account. If you sign in from a device, program, or location that we haven't seen you use before, we may ask you to enter a verification code (sent to your recovery mobile phone or email) to verify that it's really you. If the recovery options displayed for your account are out-of-date, go to the "Still can't get signed in?" section of this help article for more info. To protect your account, it may be temporarily locked after too many unsuccessful attempts to sign in. It will unlock automatically after 12 hours, but you can always regain access immediately using the Sign-in Helper. If you're caught in a loop where the sign-in screen keeps reappearing after you click "Sign in," you'll need to reset the "sign-in" cookie. From the sign-in page, click Not you? Quit and then restart your browser. Use a different supported web browser. Try logging into a different sign-in page, like our primary login page or the Yahoo Mail sign-in page. Still can't get signed in? If you're unable to use the Sign-in Helper to get into your account, because your recovery info is wrong or inaccessible, you won't be able to regain access to your account again. You're always welcome to sign up for a new account, but just make sure to keep your new account's recovery info up-to-date.